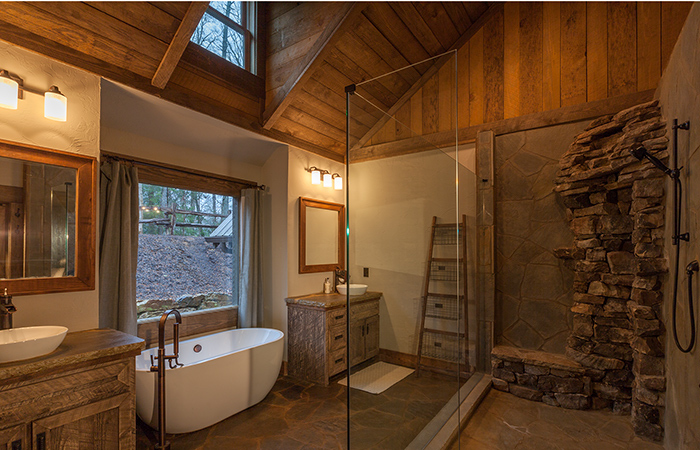 Just a scenic short 1.5 hour drive away from Atlanta, this luxurious North Georgia cabin rental has everything you need for a peaceful, privately serene getaway made for nature lovers. 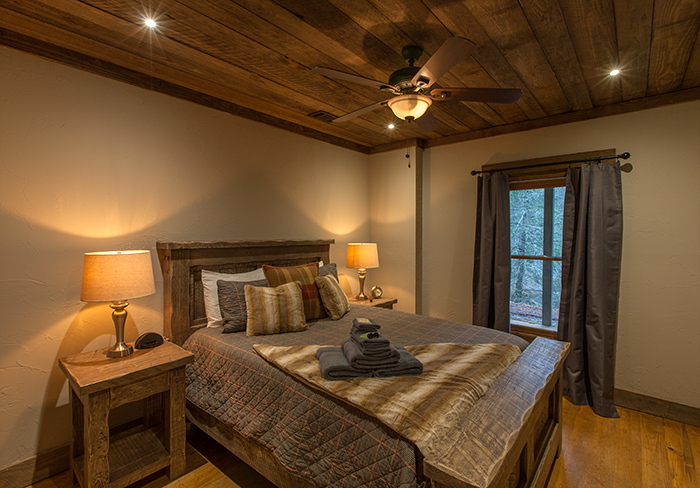 Situated on the famed Fightingtown Creek, a tributary flowing northward to the Ocoee River, you’ll enjoy the ever-flowing sounds of the water and rustling breezes of the pines. Located about 10 minutes from Historic Downtown Blue Ridge, the shops and restaurants of Blue Ridge are just minutes away. If exploring the newly renovated town of McCaysville/Copperhill with its riverwalk shops and restaurants is on your agenda, head in the opposite direction from Blue Ridge for about 10 minutes and you’re there! 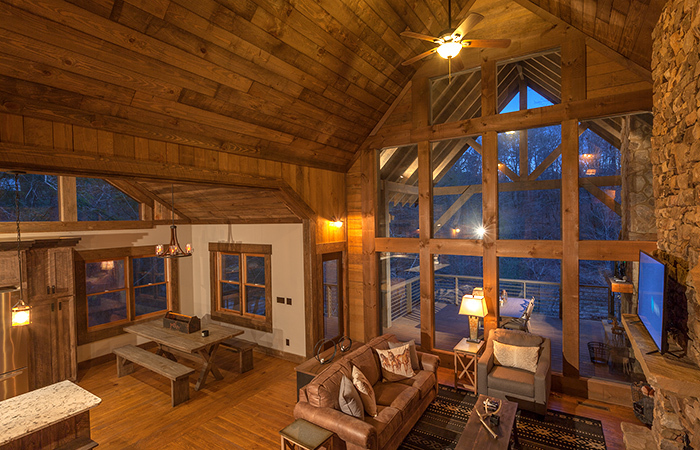 Immerse yourself in this beautifully designed showcase on the river with soaring ceilings and walls of windows that draw the nature indoors, and you will feel like you’re a million miles away. 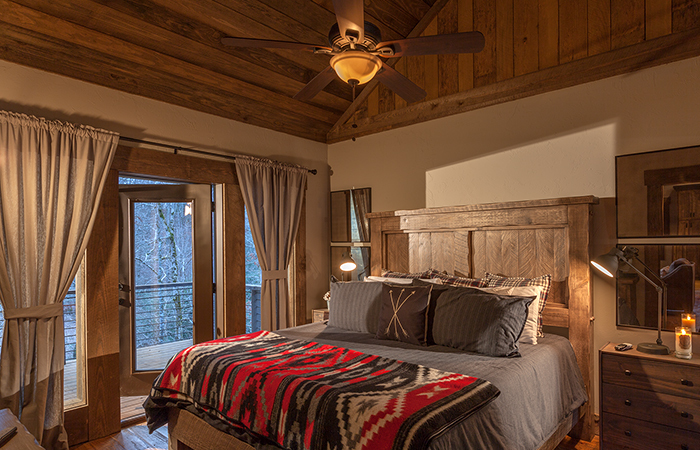 Luxurious living is what it’s all about at Creekside Bend. 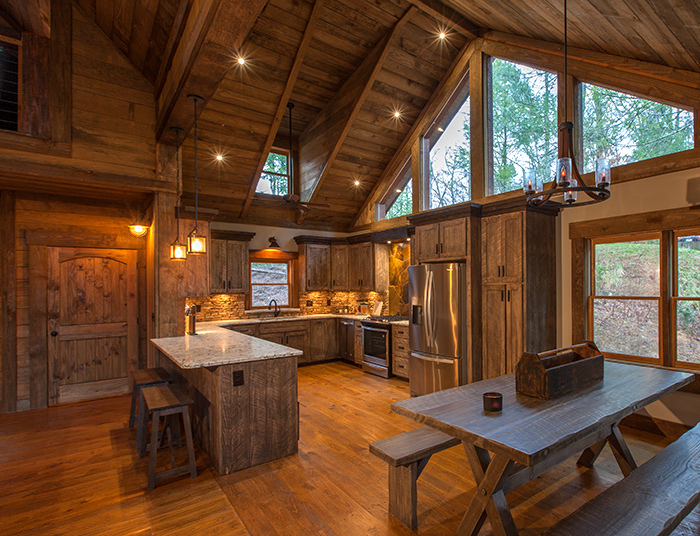 Featuring a spacious floor plan with living, dining, and kitchen artfully placed, entertaining is a joyous occasion. 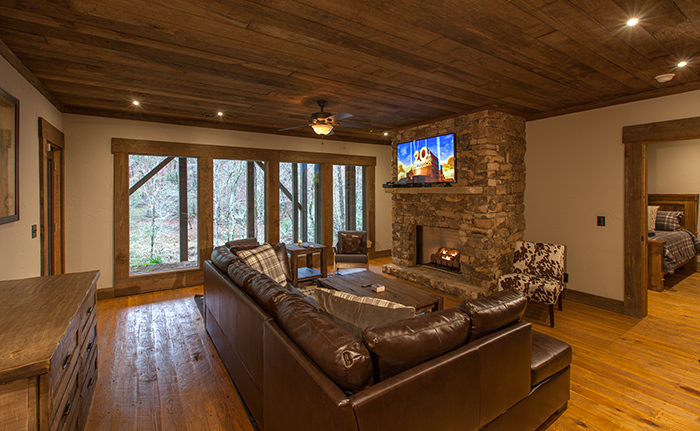 With plenty of plush seating around the stone gas log fireplace and TV, conversations will be lively and memorable. 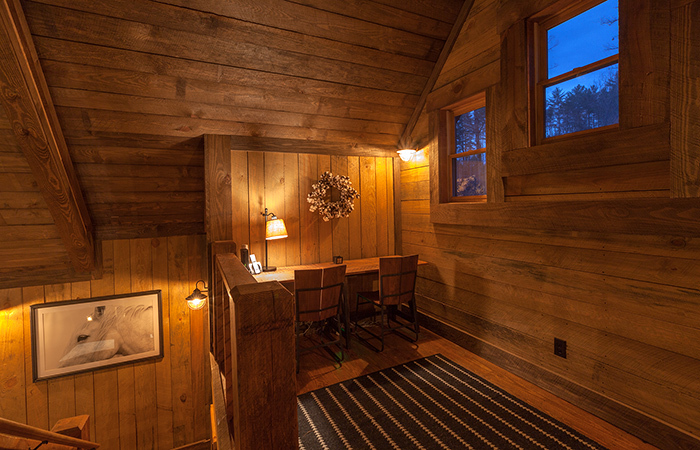 Meander outdoors on the massive covered porch and lose yourself in the sounds of the rushing river and whispering pines. 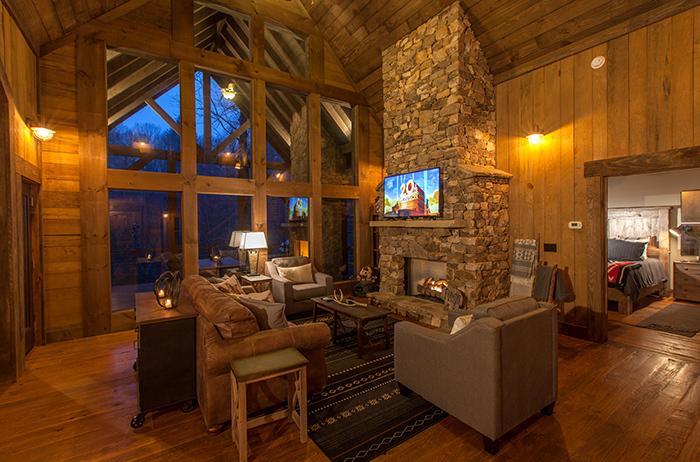 Relax and unwind in front of the outdoor fireplace and discover outdoor living at its best. Outdoor adventures fishing in the river or hiking and horseback riding nearby will please the nature lovers. Just 30 minutes away is a memorable whitewater adventure at the Ocoee Whitewater Center, including hiking trails for walking and watering holes for swimming. 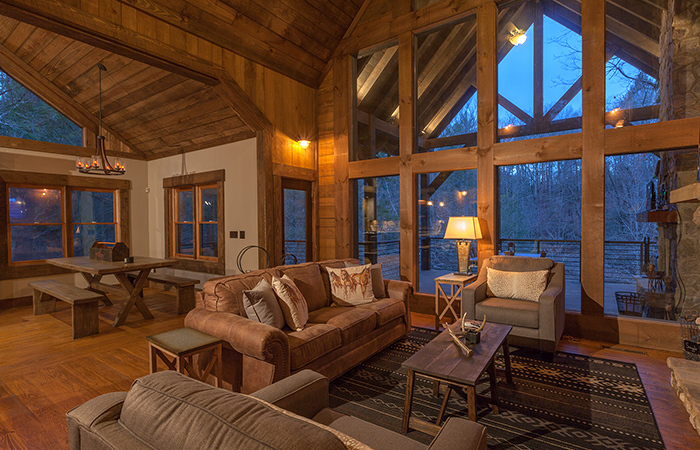 If a slower paced adventure is on the docket, then enjoy fun, unique shopping experiences in Blue Ridge and McCaysville/Copperhill. One-of-a-kind shops in both locales offer plenty of variety for everyone. 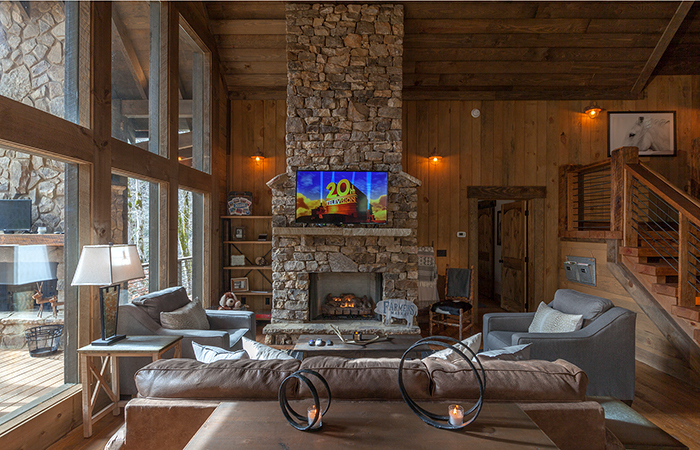 Then, at the end of a fun-filled day, head back to Creekside Bend and kick up your feet with a cocktail and enjoy the ending of the perfect day. 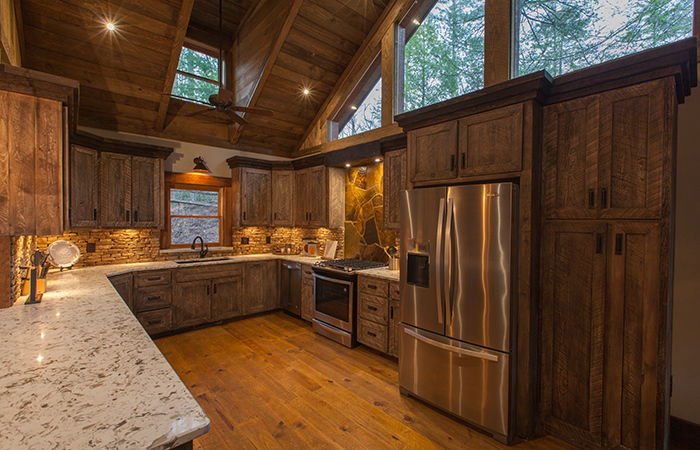 For the discerning chef in your group, cooking will be a joy in this fully outfitted spacious gourmet kitchen. 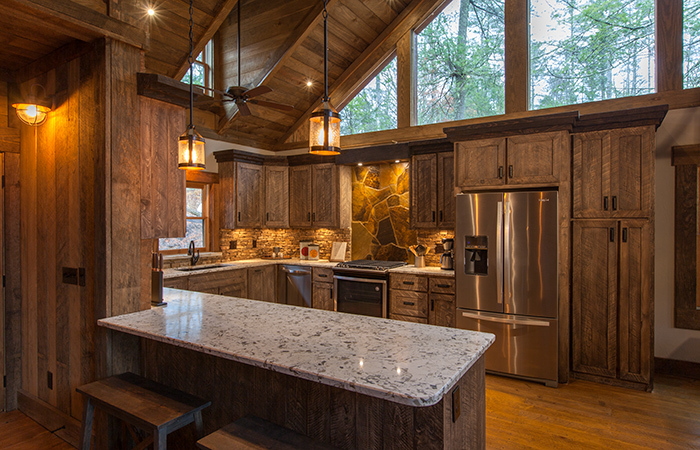 With generous granite countertops to stone backsplashes and natural daylight, cooking delectable meals will be a joy. Everyone wants to be where the chef and the food are, so hanging out at the countertop bar and large dining table still draws everyone together no matter where they are. 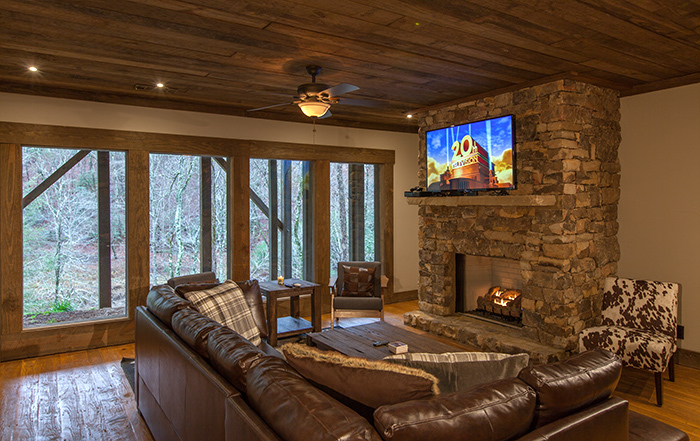 With spacious of living areas for everyone to spread out, both the main level and the terrace level offer sumptuously comfortable furniture with gas log fireplaces and TVs. When it’s time to lay your head down, you will have the best night’s sleep you’ve had in a long time in private bedrooms, each with en suite bathrooms. 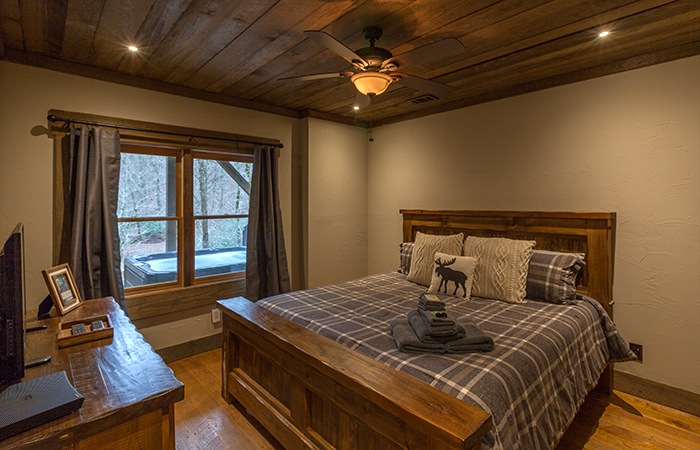 Offering a king master suite and two queen suites in addition to a built-in bunkbed, Creekside Bend is the perfect Blue Ridge cabin for families spending time together. 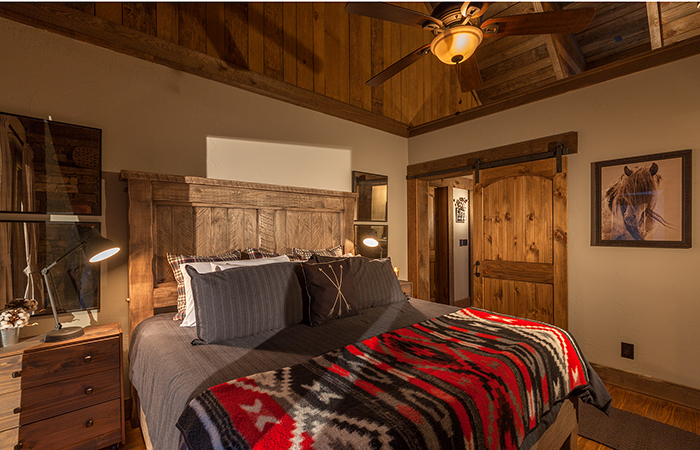 Boasting a rustic elegance of luxurious furnishings from leather sofas to sumptuous beds, your heart will have found home away from home. 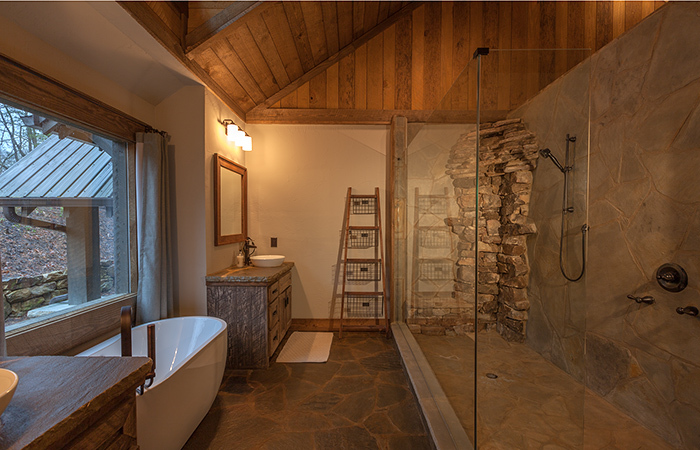 Here, the Blue Ridge mountains draw inspiration from nature to help bring into balance all the aspects of your life. 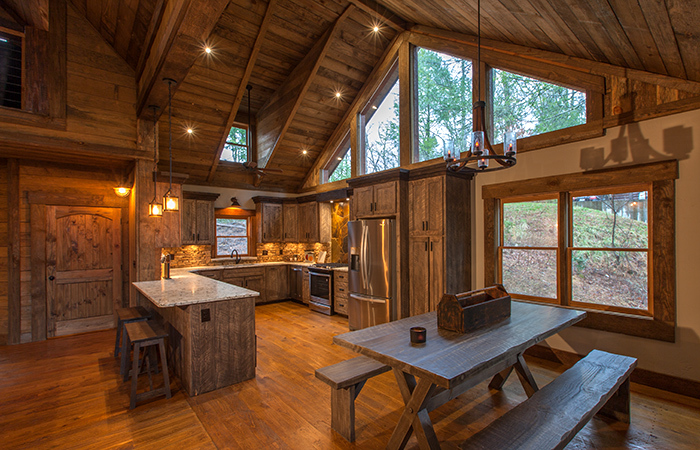 This unique cabin on the river has a feel all its own, a place of connection and surrender, a place to enjoy the moment with those you love in an exceptionally serene and peaceful North Georgia Mountain setting, enveloped in the sounds of the rushing waters, the rustle of the wind in the trees, and the beauty of the landscape. 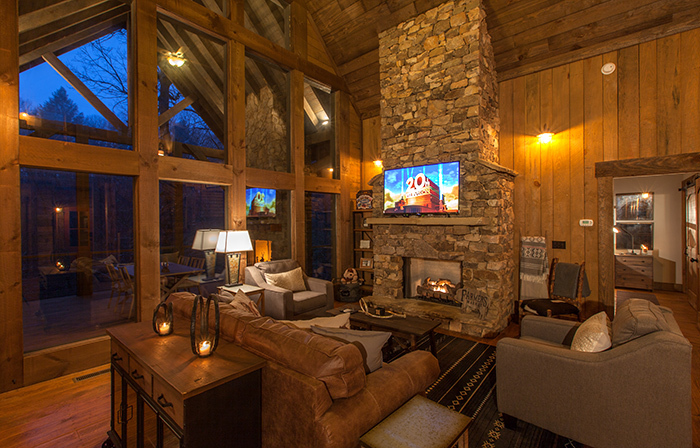 No matter what time of year, Creekside Bend will be your idyllic getaway or romantic rendezvous, a melange of beautiful Blue Ridge moments.